Calling all experienced speakers and facilitators who are ready to take it to the next level! Are you an experienced speaker or facilitator? Would you like to improve your stage presence and audience impact? Would you like to learn new techniques from one of the best? Get Ready to Expand Your Repertoire and Elevate Your Message! 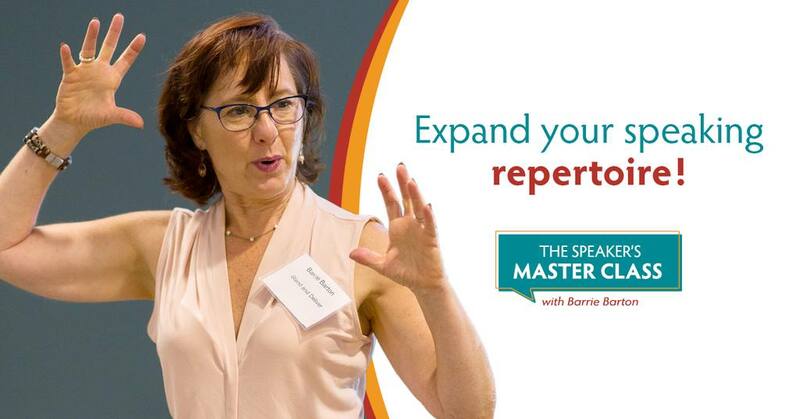 In this ½ day master class, you will have the opportunity to present, shape and receive critique from expert speaking coach Barrie Barton on an in-progress or signature speech. In additon to presentation skills, you will receive effective strategies for writing, rehearsing and delivering your next presentation with presence and power. With Barrie’s guidance, you’ll leave this workshop ready to fully step into your space as a speaker, amplify your personal presence and deliver an even more powerful message. What Will I Experience at the Speaker’s Master Class? Mindspring Consulting, 966 Tunnel Road. Just $98 for class and extras! Is the Speaker’s Master Class a Good Fit for Me? If you want to demonstrate even more confidence when presenting and speaking, the Speaker’s Master Class may be the perfect fit for you. The Speaker’s Master Class is great for: professional speakers, nonprofit leaders, business owners, CEO’s, teachers, ministers, or individuals who have been recently promoted to leadership positions who are frequently called to speak or lead workshops or trainings in their profession.